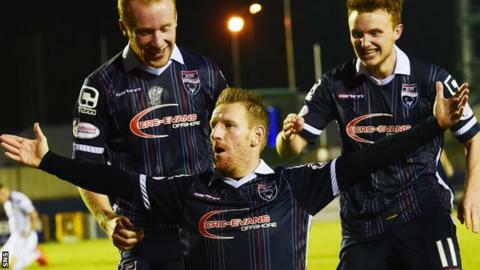 Ross County took the spoils in the Highland derby and clinched a place in their first ever League Cup semi-final. County had the better of the first half and after Martin Woods hit the bar, his corner kick met the head of Jackson Irvine for the opening goal. Craig Curran then picked out Michael Gardyne to curl round the goalkeeper. Greg Tansey's stunning, long-range effort reduced the deficit after Ryan Christie hit a post, but Caley could not find a second. This was victory at the seventh time of asking for the Staggies in the Highland derby and they will feel the wait was worthwhile given what was at stake for the club. They are now just one step away from a second major final of their own after losing the 2010 Scottish Cup Final, and have now scored 11 goals in the competition this season. By contrast Inverness are struggling to recapture the form that saw them win a trophy, clinch European football for the first time and finish third in the Premiership last season. Miles Storey should have put them ahead in just seven minutes, but he lacked confidence when sent clear by Liam Polworth and County goalkeeper Gary Woods saved comfortably. That was about it as far as clear-cut chances were concerned for Caley Thistle, while the visitors always looked capable of tearing a strip off the home side. They looked much sharper in attack with Liam Boyce twice going close and Woods smashing a shot off the crossbar from fully 35 yards before Irvine finally broke the deadlock. The Australian midfielder was unmarked as Woods delivered a corner from the left and had a free header to notch his first goal of the season and third in total for Ross County, two of them against Inverness. Any thoughts of a Caley Thistle comeback seemed doomed shortly after the break when Gardyne scored a delightful second for the visitors after being played in by Curran. There was still a fair bit of work to do, but Gardyne cut inside and bent a delightful left-foot shot into the far corner of the net from the inside right channel. Only a goal-line intervention by Josh Meekings denied Gardyne a second following a mistake by goalkeeper Owain Fon Williams, but Inverness finally rallied late on. Christie showed great awareness to backheel a cross from substitute Danny Williams, but was frustrated when that improvisational skill only resulted in hitting the frame of the goal. Then Tansey stepped up to lash a shot past Woods and spark a frantic finale, but apart from the last 15 minutes Ross County were the better side and deserved to progress to the last four. Attempt missed. Martin Woods (Ross County) right footed shot from outside the box is just a bit too high from a direct free kick. Martin Woods (Ross County) wins a free kick in the attacking half. Attempt missed. Josh Meekings (Inverness CT) header from the centre of the box misses to the right. Corner, Inverness CT. Conceded by Richard Foster. Attempt missed. Greg Tansey (Inverness CT) right footed shot from outside the box is close, but misses to the left. Substitution, Ross County. Alex Schalk replaces Craig Curran. Substitution, Ross County. Richard Foster replaces Michael Gardyne. Danny Devine (Inverness CT) wins a free kick in the attacking half. Substitution, Inverness CT. Alisdair Sutherland replaces David Raven. Foul by Danny Devine (Inverness CT). Ryan Christie (Inverness CT) wins a free kick on the right wing. Substitution, Ross County. Stewart Murdoch replaces Tony Dingwall. Goal! Inverness CT 1, Ross County 2. Greg Tansey (Inverness CT) right footed shot from outside the box to the bottom right corner. Assisted by Liam Polworth. Corner, Inverness CT. Conceded by Andrew Davies. Ryan Christie (Inverness CT) wins a free kick on the left wing. David Raven (Inverness CT) is shown the yellow card for a bad foul. Tony Dingwall (Ross County) wins a free kick on the left wing. Jamie Reckord (Ross County) wins a free kick on the right wing. Ryan Christie (Inverness CT) hits the right post with a right footed shot from the centre of the box. Hand ball by Miles Storey (Inverness CT). Attempt saved. Miles Storey (Inverness CT) right footed shot from the left side of the box is saved in the centre of the goal. Attempt missed. Jackson Irvine (Ross County) header from the centre of the box is just a bit too high. Craig Curran (Ross County) wins a free kick on the right wing. Foul by Carl Tremarco (Inverness CT). Substitution, Inverness CT. Danny Williams replaces Iain Vigurs.